So with the New Year right around the corner and lets face it, it will be here before we know it, I am already thinking about New Year's resolutions. Now I know that I should not make any resolutions since normally when I do I don't keep them. However, this coming year 2011 I have a whole list of resolutions I plan on keeping. Right now though I am excited that I am getting a jump on my upcoming resolutions. One of my resolutions is to become better acquainted with God. Can't we all use that? To feel closer to God. Unto the Hills by Billy Graham. It is a daily devotional. I can not wait to start using it and putting it to work in my life. I have the book now but have only skimmed through it only because I want to start this at the beginning of the year. 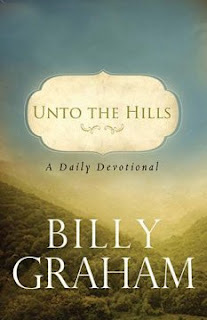 I was sent the book Unto the Hills for review from BookSneeze.com. All opinions are my own and 100% truthful. I was not paid to write this review.